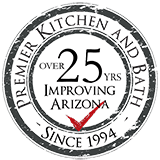 Place the management of your kitchen renovation, from initial design to flawless installation, in the trusted and experienced hands of Premier Kitchen & Bath. We’ve been serving Phoenix, Arizona, area homeowners since our inception in 1994 and have earned an impeccable reputation for the stunning results that we provide, results that were designed to truly “wow” our customers. In fact, our customers in Phoenix, AZ, appreciate that we’re an all-inclusive company – we will not only create an eye-popping kitchen renovation design that reflects your personal tastes, but we will also perform a flawless, professional build. Our process contains several steps to ensure that whatever ideas you have are only the beginning of your remodel. Our design team will flesh out the details, focusing on aesthetics and functionality, to truly leave you awe-inspired about what is possible for your new kitchen. Another great benefit of the all-inclusive service that Premier Kitchen & Bath provides is that you won’t have to worry about the hassle and extra expenses of hiring multiple firms for each step. We will be your single point of contact for the entire duration of your home improvement project. Are you ready to see what great designs our team can come up with for your kitchen renovation project? Then contact or visit Premier Kitchen & Bath today. We proudly serve homeowners in Phoenix, AZ, and surrounding areas.